Making sculpture used to be a tall order for a painter. But nowadays, a painter is likely to call herself an “artist” and use whatever medium suits the idea she wants to communicate. Take Rebecca Rutstein. I’ve watched Rutstein’s abstract art move from acrylic on canvas paintings to wall-based or freestanding sculptural arrays and back to painting, ultimately incorporating both strategies into her practice. Sculpture seems a natural step for an ambitious artist whose paintings have always been multi-layered and highly spatial. Whether they strike you as celestial or aquatic, Rutstein’s paintings dive deep into space and push out at you as if they can’t wait to be off the wall and in the room by your side. 2015 was an especially eventful year for the artist, who shows her work at Bridgette Mayer Gallery and had a solo show of her paintings and sculpture there in May, 2015. 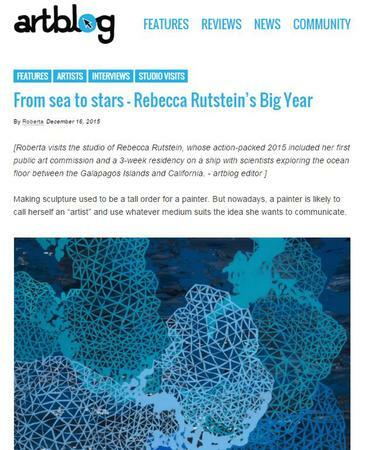 Rutstein’s work is inspired by science and the natural world, and she spent 3 weeks last summer as an Artist at Sea, painting and working with scientists mapping the ocean floor on Robert Ballard’s ship, The Nautilus. This year, she also completed her first public art piece, “Sky Terrain,” at 11th and Montgomery on the Temple University Campus. From the sea to the sky, she covered a lot of literal and metaphorical territory this year. There’s a wonderful three-minute video about her seagoing adventure, shot during her time at sea, definitely worth watching – http://rebeccarutstein.com/projects-6/ and More at WHYY NewsWorks. Bridgette Mayer Art Advisors was hired by Temple University to curate this public percent for art project. She selected the initial 15 artists. (Ultimately committees of Temple University and Philadelphia Redevelopment Authority selected me). The big commission, which took 6 months from design to fabrication and installation, was mostly crossed off her to do list, on the day I visited her studio at Crane Arts. But the artist was still cooking on all burners.. She was shipping a number of large works to Miami to appear at Bridgette Mayer’s booth at Art Miami. And, she had a furious amount of racing around to do, her route for the day including home-to-studio-to-home and then to a meeting with a photographer at her public art piece at 11th and Montgomery. She had phone calls to make, children’s school issues to take care of, and me to talk with. When I commented on the busy schedule, she laughed and gave credit to her Type A personality. Rutstein long has used patterns in her abstract works – interlocking honeycombed hexagons being a favorite. The net-like motifs suggest linkages in a floating world with no fixed horizon or boundaries. Lacy, cloud-like forms suggest nature at its most vast and contemplative. The artist says the work is metaphorical and reflects her observations on the ebb and flow of relationships. “I’m not a sculptor,” Rutstein said, explaining that she considers her new sculptural work — laser-cut, powder-coated bent steel forms — extensions of her paintings. “Sky Terrain,” the public art commission, may be an extension of her paintings, but with a colorful lighting program, the piece seems like painting with light. “Sky Terrain,” a $200,000 Percent for Art commission through the Philadelphia Redevelopment Authority, adorns a new 5-story parking structure on a dark stretch of 11th Street at Montgomery. Eighteen laser-cut sculptural elements made of bent, powder coated, 16 gauge steel are affixed to the building’s exterior at heights from 15 ft. above ground to the top of the 5-story building. During the day, the panels catch the light and cast shadows onto their bent and faceted selves and onto the building. But at night, from sunset to sunrise, “Sky Terrain” — lit from behind by a colorful computer-programmed LED lighting feature that mimics sky tones and includes twinkling starlight elements — is a stop-look-and-wonder spectacle, a light show of delicious colors and sparkling beams that not only brightens the dark night but offers unexpected beauty. Rutstein worked with a team of fabricators, structural engineers, lighting designers and installers, and she got input on the project from a group of Temple students. “Everything was custom fabricated,” she said. And the aesthetics and functionality needed to work together. The public art process is Saturn to a studio artist’s Mars — worlds apart and nothing alike. There were frustrations working with a big team and juggling multiple deadlines of engineers, fabricators and lighting specialists. At times Rutstein’s studio resembled a factory, with pieces of “Sky Terrain” lined up against the walls or sprawled on the floor as team members positioned lighting elements and others affixed specially-made brackets that would hold the pieces in place to withstand harsh outdoor elements like wind, rain, snow and ice. Responding to Temple student community members’ statements that they couldn’t see the stars at night in the city because of light pollution, the artist gave them stars. She added twinkling lights to supplement the colored lighting program but worried at first that the blinking lights might seem “cheesy.” As the project developed, her doubts fell away. “The twinkling adds an unexpected layer of animation…” she said in a follow up email. Meanwhile, the Temple students love their new art at 11th Street; Rutstein has witnessed them stopping to watch the colors change and the stars come out. “The goal is to beautify that corner,” she said of the dark, narrow intersection at 11th and Montgomery. “The challenge is to transcend public art and have a moment,” she said, speaking of that moment you can have when art slows you down and offers you unexpected beauty on a walk through the city. So what’s next for this busy artist? At year’s end, in addition to all else, she says she’s done a couple of sculpture commissions for clients in Boston and Princeton, and she’s readying some work go go on the road in a traveling solo exhibition of science-related art that will appear in science venues and museums starting summer, 2016. She may return to the sea, next summer, to the Nautilus ship to participate in another art+science ocean floor exploration. And importantly, in 2016 she will be spending more time in the studio, since she is making enough money on her art now to let go of most of her freelance graphic design work, which has been her bread and butter since the late 1990s.